This was a hard Junior Hunter test. Only 31 out of 56 dogs passed the first series, qualifying to be called back to the second series. The first two retrieves started with a live flier at about a distance of about 80 yards. From the start line to the area of the fall, it was all tall grass (knee high on Russ, head-high on Cooper), with an patch filled with a flock of duck decoys. Once Cooper blew past the decoys and got to the area of the fall, it took him about 30 seconds to find the bird, using his nose. Sadly, this bird was mortally wounded, and not quite dead when it landed. * One of Cooper’s virtues is that he’s not intimidated by a live bird, as he’s proven with chukars in actual hunting. The second duck was launched against a backdrop of tall trees, and never visually cleared the treeline. Plus, the shotgun sound didn’t go off until after the duck was at the apogee of the arc — meaning that if the dog wasn’t looking in the correct direction at that moment, the dog had only a fraction of a second to hear the sound and then turn his head see the dark duck fall in front of a line of dark trees, behind tall cover, over 100 yards away. Even though the duck landed into an area dotted with tufts of grass, the area between the start line and the area of the fall was interspersed with tall grass, ferns, and blackberries. Making the 2nd retrieve even tougher was the fact that the 1st bird had been a live flier. Most dogs are attracted to live fliers, so when the dog is confused or can’t find the 2nd bird, they’ll often go back to where the live flier fell. This was the downfall of many of the dogs that didn’t qualify in this first series. This first series took a long time. A lot of time was spent watching a lot of dogs, who were doing long, slow, and sometimes futile searches for hard-to-find ducks. With 56 dogs, the first series started at just before 10 and didn’t end until about 3:30. Amazing as it seems, on all of Sauvie Island there was no water available for water retrieves for the Junior level tests. So the AKC gave a dispensation to allow the second series of retrieves be held on land instead. These two retrieves were somewhat easier, if for no other reason than they were only about 80 yards each, and no live fliers. Plus, in these retrieves, the shotgun sound preceded the duck’s being launched, and the duck calls were close enough to hear. The only real obstacle in this series is that the first duck landed in a dip in the land. When most dogs went out (including Cooper), they circled around the depression, and only went down into it when they scented the bird. The second bird was basically a straight, flat line through tall cover. Cooper went wide of the fall, and looped back around to the bird when he scented it. And as before, he brought the bird back to hand, and hopped into the heel position, waiting for that elusive 3rd bird. Oh, well. He’ll have to wait until he gets into the Senior and Master levels for that to happen. * The fact that ducks (“live fliers”) are killed during the test is the one part of this whole enterprise that troubles me. The ducks start out caged, and then they’re thrown up into the air by an assistant and shot by the gunner. Most ducks are lucky and killed outright. A very few are wounded and are only killed after they’re retrieved, and that makes me very sad. I realize that all these ducks are used, reused, and then frozen and reused again to train dogs, and that’s a necessity when you’re training a hunting dog. Hunting dogs have to practice on real birds, or they won’t be able to retrieve birds. 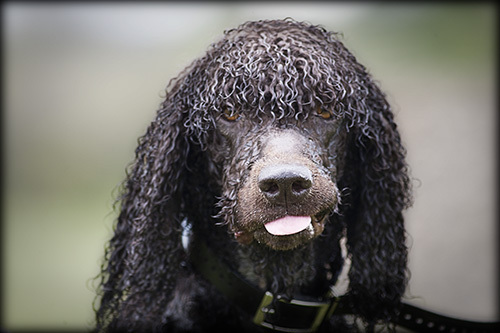 Cooper posed for this portrait, taken just after the water series in his first AKC hunt test. Ten months of training has led up to this day: Cooper’s first AKC hunt test. It was a huge hunt test, with 59 dogs running at the Junior level. Russ and Cooper were slated to run 57th, but fortunately, got to run a bit earlier than that. Because pro handlers handle so many dogs, they’re given a bit a leeway to run when they can, and that opened up an earlier spot for Team Cooper. The land series consisted of retrieving two ducks, a launched bird and then a live flyer. For the first bird, the dogs had to mark the duck and then run through (or around) a small patch of blackberries. Nothing significant obscured the dog’s view of the 2nd bird. Both retrieves were about 80 yard, and both ducks landed in short grass cover. At the Junior level, the handler is allowed to hold the dog’s flat buckle collar in order to restrain an over-eager dog. This rule must have been written with Irish Water Spaniels in mind, specifically Cooper. But his retrieves were text-book: Cooper went out and back. The only glitch was that he dropped the first bird at the line before Russ could get a hold on it. But the rules state that the dog can pick the bird back up and then deliver it to hand. The dog qualifies as long as the handler does not touch the bird or the dog before the dog delivers the bird. Russ told him to “fetch it up!” and fortunately, Cooper complied. The 2nd retrieve worked out well, too. Cooper remembered his flyball rules, and ran out and back as fast as he could. Plus, the live flier landed on it’s back with white breast feathers showing, making it easy for Cooper to find. Then we went on the water series. Today we had what one commenter called “splashing water.” Not deep enough to swim in, but dogs did need to be willing to go through water to get their birds on the other side. The judges planned the retrieves to make it easy for most dogs to resist “running the bank” (going around the water rather than through it) on the first bird. The first bird was straight across the middle of the pond. However, the 2nd bird was closer to the edge of the pond, so some dogs might think it was simply more efficient to run around rather than through. More efficient maybe, but against the rules for any level above Junior. And while all dogs went through the water to get the birds, a few dogs ran the bank on their returns. It seems like a silly rule to me — efficiency should be rewarded, I think. In real hunting situations, as along the mouth of the Columbia River, many hunters want their dogs to run the bank for as long as possible, so the dogs won’t use up all their energy swimming in cold currents and tides. All this means that for most dogs running hunt tests, not running the bank is definitely something you have to train for. Cooper’s love of water has meant that running the bank hasn’t been a problem. So far, anyway. Cooper is so eager for the work. You can see it in the video — after the 2nd bird in each series, he comes to heel and starts to scan the horizon for more birds. There just have to be more than 2 birds out there, right? And another bit of humor for the day: While waiting in the holding blinds for the water series, the handler before Russ said, “I see you’re running an exotic dog, too.” Exotic — translated as “not a Lab, not a Chessie, not a Golden.” This handler had a Nova Scotia Duck Tolling Retriever. A NSDTR is another rare-ish breed, like an IWS, but both have long been used and bred to the work. Anyway, back to the story and its happy ending. 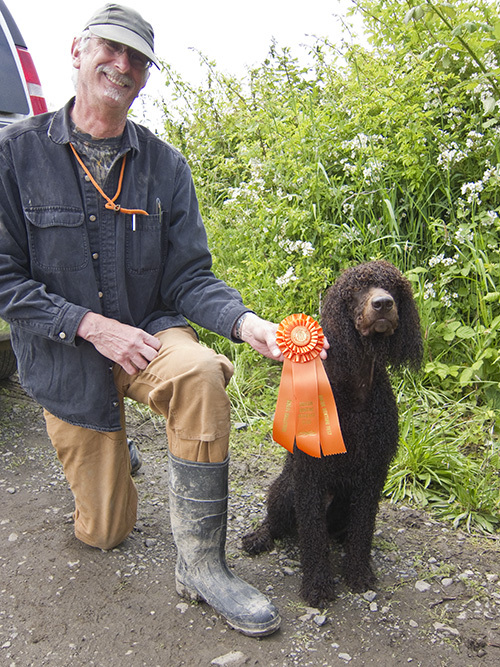 Cooper and Russ did really well, and the judges recognized that with a pass and a ribbon. Oh, and about the pink flamingos that you see at the starting line: they’re a tradition at this Memorial Day hunt test on Sauvie Island. 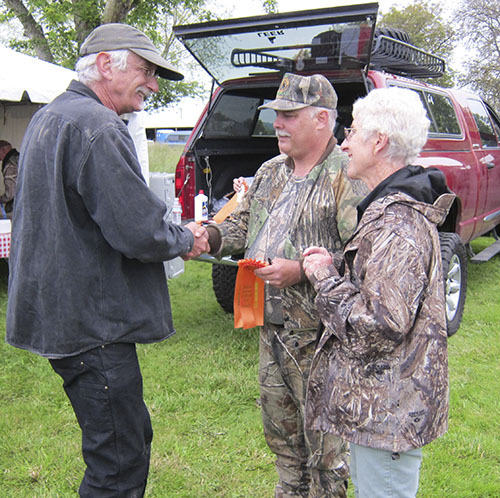 I’m not sure where the tradition started, but the host club, Oregon Hunting Retriever Club, auctions them off each year to benefit breast cancer research. getting ready for hunt test and etc. 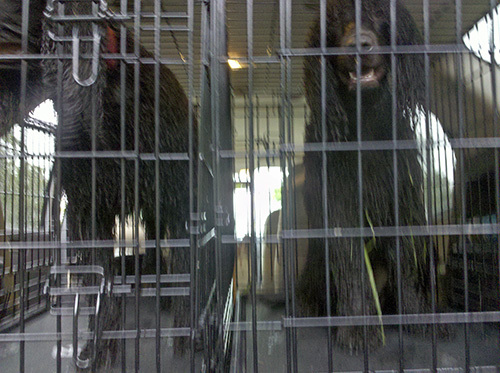 Russ took this picture with his phone this evening, at my request: dogs in their crates, in the dog car, in the rain. We had just put up the dogs after a training session in a local dog park. Being that it was pouring down rain, the park was empty. Perfect! The park had some tall grass — just what we wanted. That way, when I threw the bumpers, they’d fall into the clumps of grass, and Cooper would actually have to visually mark where they fell, rather than relying on seeing them when he got to the area of the fall. He did great. Marked the bumpers, retrieved them speedily, and returned them to hand. Just what we want for tomorrow, at Cooper’s first AKC hunting test. He’s entered in the Junior division. The only downside of tonight’s training session was the darn grass. I don’t know if it’s just springtime, or the grass has not been cut, or what, but the blades of grass were sticky. You can see just some of it on Tooey’s legs in the picture. I plucked strands of grass out of everywhere: from her legs, stuck to her belly, behind her ears, all around her rear. Cooper had his share, too, but he doesn’t have a long show coat, like Tooey. And it was nice to have a car all set up to transport wet, muddy, grassy dogs, safe and contained in their crates. Or maybe “hate” is too strong a word. But what would you think about people who strew broken glass all over a heavily trafficked public staircase? One that’s used by joggers, kids, dog walkers, and dogs? Now, most joggers, kids, and dog walkers have shoes. But the poor dogs? Their pads are naked. After a few years, the pads are toughened, but they’re still naked, and broken glass cuts. 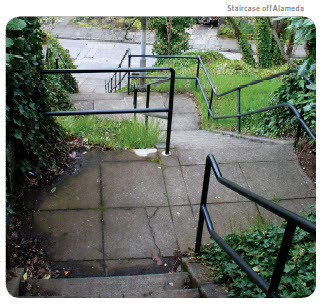 You can see by the picture that many of these neighborhood staircases are zig-zagged. So you can’t always see until you get to it that there is broken glass on a staircase. This has happened several times now. The first day, I was able to see the glass before we got to it, and turn around. Yesterday, I didn’t see it until we were on top of it. Tooey hadn’t stepped on anything yet, so I told her in no uncertain terms to STAY!, and brushed as much of the glass as I could to the sides. Thank God no squirrel showed up. I’m not certain that Tooey would have stayed if she’d seen a squirrel. But that didn’t happen, I got all the glass picked up, and we were able to move on without injury. You’re probably wondering why I don’t just walk someplace else? Well, stairs are good exercise for me and Tooey. They’re are quite a few of these public stairways, they are heavily used, and, heck, I just want to walk on them. And I can never know which staircase is going to have glass on it until I get there. Makes me mad. Sometimes I am really disgusted by people. 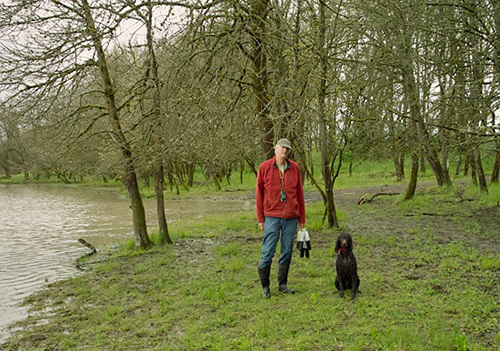 Russ, Cooper, Tooey, and a friend, Paul, went out to Sauvie Island for some hunt training. There is a dog training area out there where you can get in some good water and field work. You need a dog training permit and parking pass, but it’s well worth it. With Paul’s help as bumper launcher, Russ practiced doubles and marking. He said that Cooper did great, even to the accompaniment of Tooey’s barking. Probably her commotion was a combination of the facts that Tooey LOVES to swim and HATES to be left out of anything. And here she had to stay in the car and watch Cooper, out of the car and swimming without her. Finally, Russ let her out, and while he and Cooper kept working, Tooey just swam back and forth in the pond. Who needs bumpers to have a good time? Please God, never let that phrase pass my lips. If my dog is ever frightening, intimidating, annoying, or even just being too pushy with another dog, just let me just say, “Sorry” and take my dog out of the area. Yesterday, Tooey and I were leaving after a day at the Delta, and my eye was caught by this German Shepherd about 150 yards away. The dog did a hard, direct stare at Tooey, hunkered down into a crouch, moved her weight forward, raised her tail stiffly, and then took off, straight at Tooey. Tooey tucked her tail, dropped her head, and started moving away from the German Shepherd. Sooner than I consciously realized what I was doing, I was running toward the soon-to-be intersection between the two dogs, bellowing, “NO!” as loud as I could. I reached the German Shepard, but she simply maneuvered around me and kept going for Tooey. I was leaning down to get a rock when the GS’s owner finally called called her dog off. Has that woman never read, seen, or learned anything about dog behavior and body posture? The pit bull owner said what I want to say if (God forbid) my dog is ever frightening, intimidating, annoying, or being too pushy with another dog or person. She just said, “Sorry. We can go someplace else” and took her dog away.